Chorthippus parallelus is typically predominantly green. There is often a dark grey/brown stripe running through the eye and the flanks of the abdomen are usually more or less mottled black or with distinct black bars. The hind femur is typically plain pale brown or greenish above with a herringbone pattern extending down the middle. Like the Field Grasshopper, some rather bizarre colour variations occur in this species; purple specimens are not that uncommon. At maturity, the females wings barely extend halfway down the abdomen. Mature males have longer wings that almost extend to the tip of the abdomen which, at maturity, is brownish. 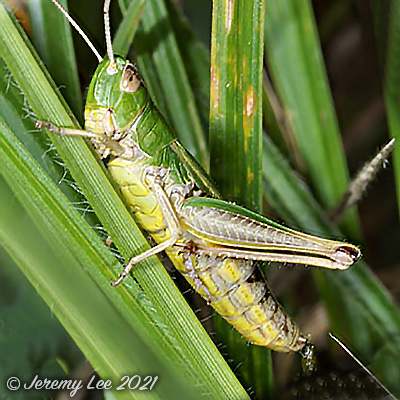 Its life cycle is very similar to that of the Field Grasshopper although the emergence of the nymphs and adult maturity occur slightly earlier. Very common and found in all but the driest grassland sites. Nymphs from late April to June, adults from June until mid November.